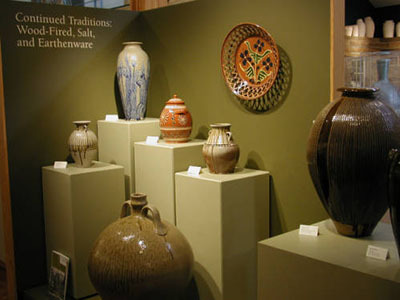 The 2005 General Assembly designated the Seagrove Area as the State Birthplace of North Carolina Traditional Pottery (Session Laws, 2005, c. 78). The bill to name Seagrove as the State Birthplace of North Carolina Traditional Pottery was introduced by Senator Jerry Tillman of Randolph County, though it was co-sponsored by all the area’s senators. Tillman began his teaching career in Seagrove and expressed a desire to recognize the area’s heritage statewide. The bill was unanimously passed by both the Senate and the House. The area centered around Seagrove (including portions of Randolph, Chatham, Moore, and Montgomery Counties) has been a center for potters and pottery making for more than 250 years, and is considered the longest continual history of pottery making in the United States. Several families have been creating pottery in this clay rich area of the Piedmont for nine generations. The original potters of the area were the Native Americans, who first began creating items from clay and hardening them in fire around 3,000 years ago. The advent of European exploration brought Spanish techniques to America in the 1570’s. The first modern potters in the Seagrove area were immigrants from England and Germany that settled before the revolutionary war. Early potters prospered in the area partially due to their access to the Great Wagon Road, which ran from Pennsylvania to Georgia and brought many potential customers through their community. Pottery was popular in this rural area as it provided extra income families while easily fitting around the farming schedule. Seagrove potters in the mid to late 1700’s first produced redware with local clay that, when fired, hardened to a reddish orange color. By the 1800’s, however, most had switched to salt glazed stoneware. In the mid 1800’s, the construction of the Old Plank road, which ran between Salem (now Winston-Salem) and Cross Creek (now Fayetteville,) gave the potters access to a wider local market and helped form the reputation of the Seagrove community as a leading pottery producer. For generations, techniques were passed through the generations only by blood or marriage. Today, several area community colleges teach basics of the craft. The Seagrove area is considered to have the highest concentration of potters in the world outside of Japan. At the time of the bill, the town had about 250 residents and about 130 potters within a 15-mile radius. While some use more modern techniques, there are several that continue to use the traditional methods, including digging local clay, mixing their own glazes, and firing pots in wood burning kilns that can reach over 2,400 degrees. Notable potters of the area include Jacques and Juliana Busbee, who founded Jugtown Pottery in 1917, and Dorothy Cole and Walter Auman, who opened Seagrove Pottery in 1953 and started the Seagrove Potters Museum in 1969. This rich and unique heritage is currently celebrated in many ways. The annual Seagrove Pottery Festival has been held since 1982, starting as a local gathering of potters to promote tourism for the pottery community. Today it is a two-day event with over 120 area potters and other traditional craftsmen, and has been named one of the Top 20 Events in the Southeast by the Southeast Tourism Society. 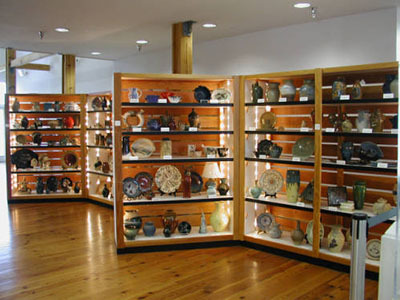 The North Carolina Pottery Center was opened in 1998 to promote and preserve the State's unique and long-lasting contribution to this craft. 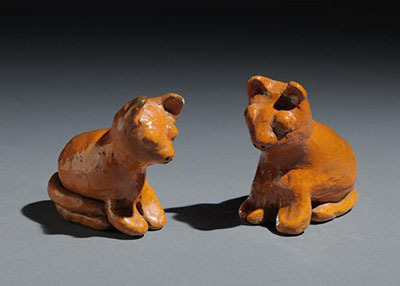 The Pottery Center features both permeant and changing exhibits on local and state pottery and serves as a museum, educational center, and promoter for the industry. It is the only state-wide facility in the nation devoted solely to pottery. In an average year, the center receives visitors from nearly every state and over 20 countries. AN ACT RECOGNIZING THE SEAGROVE AREA AS THE BIRTHPLACE OF NORTH CAROLINA TRADITIONAL POTTERY. "§ 145-23. State birthplace of traditional pottery. The Seagrove area, including portions of Randolph, Chatham, Moore, and Montgomery Counties, is designated as the official location of the birthplace of North Carolina traditional pottery." In the General Assembly read three times and ratified this the 2nd day of June, 2005. Anderson, Mary. "It's official: Seagrove birthplace of pottery," Courier-Tribune, The (Asheboro, NC), June 09, 2005. Gaston, Janice. "Lotta Pottery - Seagrove artisans do their thing - simply and beautifully," Winston-Salem Journal (NC), June 03, 2005: 1. Mercer, Marsha. "Going to Pot in North Carolina." Gettysburg Times, June 27, 2006. North Carolina Pottery Center. http://ncpotterycenter.org/. Why is it called pottery birth place????????????? Thank you for your note--that's an excellent question. The actual designation is "State Birthplace of North Carolina Traditional Pottery." The article says that the motion in the legislature "was introduced by Senator Jerry Tillman of Randolph County, though it was co-sponsored by all the area’s senators. Tillman began his teaching career in Seagrove and expressed a desire to recognize the area’s heritage statewide." I don't think this was meant to indicate that no pottery had ever been created on the land that eventually became the state of North Carolina.